The Federal Trade Commission announced complaints and proposed court orders barring four national retailers from mislabeling and advertising rayon textiles as made of “bamboo,” and requiring them to pay civil penalties totaling $1.3 million. Under the court orders settling the FTC’s charges, Bed Bath & Beyond Inc. will pay $500,000; Nordstrom, Inc. will pay $360,000; J.C. Penney Company, Inc. will pay $290,000; and Backcountry.com LLC will pay $150,000 for allegedly violating the FTC Act and the agency’s Textile Rules. 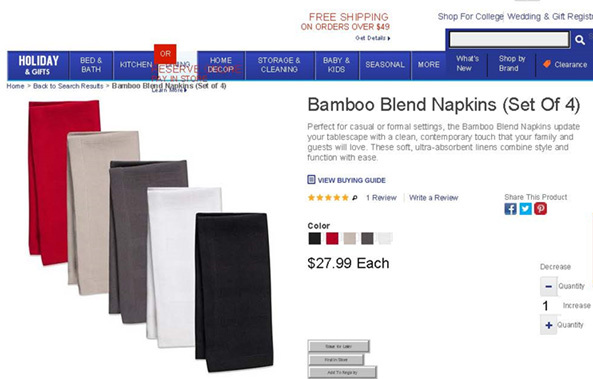 Example online store product page for "bamboo blend" napkins. The complaints announced today allege the four companies broke the law by continuing to misrepresent or mislabel rayon products as “bamboo” despite receiving warning letters from the FTC in 2010 and a synopsis of previous litigated cases against marketers for deceptively labeling rayon products as bamboo. The Commission charged the companies with violating the Textile Act and the Textile Rules and with violating Section 5(m)(1)(B) of the FTC Act by falsely and deceptively selling the mislabeled products, despite knowing that doing so was illegal and could subject them to civil penalties. J.C. Penney sold numerous “bamboo” products in its stores and online, including “Muk Luks 4-pk Men’s Bamboo Socks.” It also falsely claimed “bamboo” gave the products antimicrobial properties. Similarly, Backcountry.com sold “bamboo” textiles, such as “Bridgedale Bamboo Crew Sock – Men’s.” Backcountry also made anti-microbial claims for its “bamboo” products. The proposed orders settling the FTC’s charges are identical, aside from the civil penalty amounts. They prohibit the companies from violating the FTC’s Textile Act and Rules by failing to properly identify the fiber content when labeling and advertising any textiles containing manufactured fibers. The Commission votes approving the complaints and proposed civil penalty orders, and authorizing the staff to refer them to the Department of Justice for filing, were each 4-0. The DOJ filed the complaints and proposed orders in U.S. District Court for the District of Columbia on December 9, 2015. The FTC also announced today it is sending letters to other retailers to help protect consumers from deceptive “bamboo” claims – especially during this busy shopping season – by imploring retailers to check their own inventories and ensure proper labeling and advertising of rayon textile products. NOTE: The Commission authorizes the filing of a complaint when it has “reason to believe” that the law has been or is being violated, and it appears to the Commission that a proceeding is in the public interest. Civil penalty orders have the force of law when signed by the District Court judge.